Once upon a time, when the number of visitors coming to the Outer Banks was perhaps half of what it is today, the highways and roads of the area were adequate to meet transportation needs. That is no longer the case. Visitors and locals are still able to move around fairly well, but there is no doubt that traffic has been steadily increasing, and improvements to our highways are needed. NCDOT has been active in moving projects forward. Like any major undertaking there is considerable planning involved, as well as funding issues. Nonetheless, there are some major projects on the books that, if and when implemented will significantly improve the Outer Banks transportation system. The replacement span for the aging Bonner Bridge over Oregon Inlet the is the most visible part a the project to improve the roads between the northern Outer Banks and Hatteras Island. 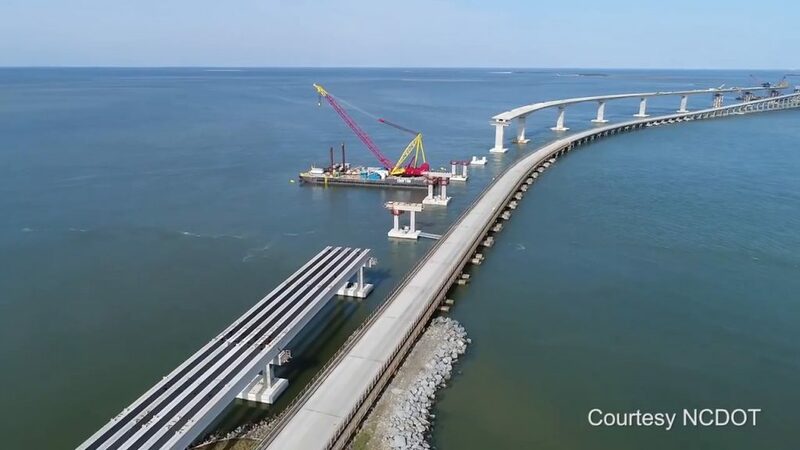 However, the entire project area includes all of Pea Island, which is NC 12 from the south end of the Bonner Bridge to Rodanthe. One part of the project is already completed, although it will have to be revisited at a later time. The Captain Richard Etheridge Bridge spanning the New Inlet area has a projected 25 year life and is not considered a permanent solution. At a future date, a more permanent solution will be constructed that will either take the road into the sound, possibly linking with the proposed Jug Handle at the S curves, or moving the road to the west and constructing a bridge with a longer projected lifespan. The most visible component of the Pea Island project is the replacement span for the Bonner Bridge. Soaring above the old bridge, it is an engineering marvel. Clearly NCDOT and project engineers learned a lot from the Bonner Bridge. The navigation spans are now wider and much higher, and there are 16 of them instead of just one. The pilings that support the bridge are being driven much more deeply into the sediment beneath Oregon Inlet. There are other improvements as well, and as a consequence, the projected lifespan of the bridge is 100 years. Construction appears to be on schedule to open the bridge in the fall of this year. After the bridge is open, the old span will be demolished with much of it being used for artificial reefs off the Outer Banks coast. The most dynamic—read prone to flooding—area of Pea Island is the S Curves just north of Rodanthe. Beach nourishment has been used as a temporary protection method for the road at that location, but because of the undersea geology, nourishment is not considered a permanent solution. NCDOT plans call for a jug handle. The road will cross a short area of marsh and wetland, swing out into the sound and form a three mile jug handle shape coming back to the existing NC 12 at the Island Convenience Store in Rodanthe. According to NCDOT the project is due to get underway this summer with an expected completion date in 2020. There are very few things as terrifying in life as pulling into the center turn lane on the Bypass at the same time a driver from the other side pulls in. Or—which can be even more frightening—the other driver is using the center turn lane as an acceleration lane to merge with traffic. In concept the center turn lane of the Bypass allows left turning traffic to make their turn without slowing or stopping cars behind them. In reality, it’s a study in terror during peak season when traffic far exceeds the capacity for the concept planners had in mind. Aware that it is a safety issue, NCDOT has in it’s lates STI (State Improvement Investment) documentation a plan to create barricades along much of the center lane with controlled left hand turns at select intersections. The project ranks pretty high in the system NCDOT uses to evaluate their priorities, so there is a good possibility that it will move forward. However, do not look for anything to happen right away. Right of way acquisition is not scheduled to begin until 2015 with construction scheduled for 2027.
Who knows what’s happening with the Mid Currituck Bridge…and we’re not being facetious with that. The most recent schedule for the $489 million project that will cross the Currituck Sound at Aydlett called for a Record of Decision (ROD) to be released in April of this year. That date has been pushed back to sometime in the summer, although nothing has been specified. According to the NCDOT a reevaluation of the 2012 Environmental Impact Statement (EIS) contributed to the delay. Project managers felt the six years that had passed since the original EIS was issued necessitated reviewing the document. The ROD is the final step needed to outline the scope of the project, its cost and schedule. Without that document contracts cannot be awarded and the project cannot move forward. Although NCDOT has indicated that they wish to proceed with the project there are quite a number of loose ends and at this time, there is neither a start date nor a completion date posted. In conjunction with the Mid Currituck Bridge, NCDOT is planning on removing the turn lane from the Caratoke Highway (US 158) from the bridges interchange to the Wright Memorial Bridge. The road will be a four lane highway with left turns at managed intersections. Under any circumstances, it seems likely that when the ROD is issued, the project will face legal challenges from a number of environmental groups that contend the bridge will exacerbate congestion, cause environmental harm to the Currituck Outer Banks and that there are less expensive and less intrusive means of alleviating traffic congestion that NCDOT has not explored. The bridge will be a toll road when completed and will be administered by the North Carolina Turnpike Authority.